Q: Last week Foreign Minister Wang Yi attended the series of Foreign Ministers' meetings on East Asia cooperation. How does China see its role in promoting East Asia regional cooperation and resolving regional hotspot issues? A: The series of meetings on East Asia cooperation include the ASEAN Plus Dialogue Partners (the ASEAN +1), ASEAN Plus Three (the ASEAN+3), the East Asia Summit (EAS), the ASEAN Regional Forum (ARF) and other East Asia cooperation mechanisms and meetings. Foreign Minister Wang Yi led a delegation to attend the series of Foreign Ministers' meetings in Manila. The series of meetings focused on East Asia regional development and cooperation and witnessed exchanges of views on the international and regional situation and hotspot issues. At the China-ASEAN Foreign Ministers' meeting, the Chinese side made a seven-point proposal including the "China-ASEAN Strategic Partnership Vision 2030", which have received warm responses from ASEAN countries. The two sides agreed to, taking the opportunity of the 15 anniversary of the establishment of strategic partnership between China and ASEAN next year, upgrade the quality of China-ASEAN cooperation, forge a higher level of China-ASEAN strategic partnership and build a closer-knit China-ASEAN community of shared future. At the foreign ministers' meetings of ASEAN +3 ,the EAS and the ARF, the Chinese side also put forward over 10 new initiatives aimed for stronger practical cooperation for East Asia, which have been warmly welcomed by various parties. The ARF foreign ministers' meeting issued the Statement on Enhancing Cooperation in Addressing and Countering the Drug Problem initiated by China and sponsored by the Philippines. On the whole, positive factors and energies have featured in the series of meetings, which gives prominence to the political will of regional countries to focus on cooperation, jointly strive for development and meet challenges. In terms of hotspot issues, the series meetings paid the most attention to the Korean Peninsula nuclear issue. Foreign Minister Wang Yi have stated China's position on multiple occasions and spared no efforts to promote talks. He pointed out that the core of the Korean Peninsula nuclear issue is security issue. Various parties should undertake their responsibilities, work for the shared goal, give positive consideration to the "suspension for suspension" proposal in an effort to cease the vicious circle of current situation and find a breakthrough for the resumption of peace talks. As to the South China Sea issue, various parties overwhelming affirmed the positive and sound momentum of the situation in the South China Sea. 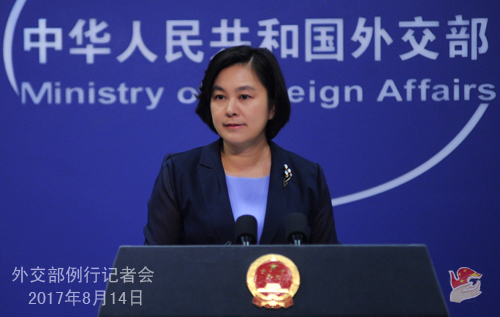 The foreign ministers of China and ASEAN countries have approved the Framework of the Code of Conduct in the South China Sea (COC) and announced that the consultation on the substance of the COC will be launched in due course this year after the preparation is well made. All the above-mentioned outcomes have fully showed that China and ASEAN countries have the wisdom and ability to properly manage the differences, formulate commonly agreed regional rules and uphold peace and stability in the South China Sea. In stark contrast to these mainstream positive aspects, certain non-regional countries seem to dwell on the past in disregard of the upturn of the situation, reluctant to recognize the precious outcomes of the concerted efforts of China and ASEAN countries, and even send out negative message with an attempt to provoke disputes. I hope these countries can recognize the reality clearly at an early date, act in line with the trend, respect and support the concerted efforts by regional countries to uphold peace and stability in the South China Sea, and play a constructive role in regional peace and stability. Q: A White House official said that the US is going to announce an investigation into China's "illegal" trade practices next Monday, including the theft of intellectual property rights and compulsive technological transfer. How do you comment on that? A: We have noted the relevant reports. The Spokesman of the Ministry of Commerce made remarks on this issue on August 3, stressing that any member of the WTO should observe its rules in taking trade measures. As we stated many times before, given the increasingly converging China-US interests and the close-knit pattern of the two countries being mutually dependent, there will be no future or winner but only losers in a trade war. We have also stressed on multiple occasions that the economic and trade relations between China and the US are mutually-beneficial and win-win in essence. An important outcome reached in the first round of China-US Comprehensive Economic Dialogue not long ago is that the two sides have set the right direction for China-US economic cooperation, that is, staying committed to taking win-win cooperation as the basic principles to develop bilateral economic and trade relations, dialogue and consultation as the basic method to solve differences and the maintenance of communications on major economic policies as basic means for dialogue and cooperation. China stands ready to continue to work with the US side and ensure the sound and steady development of China-US economic and trade relations on the basis of mutual trust and quality and mutual benefit. Q: According to reports, a White House official also claimed that President Donald Trump mentioned the possibility of a trade investigation in Saturday's phone call with President Xi Jinping. Can you confirm that? What kind of message did the Chinese side convey concerning the Korean Peninsula issue during the conversation? A: I don't know whether you were present when the telephone conversation was held, but I can tell you that on August 12, President Xi Jinping held a telephone conversation with President Donald Trump at request. The two heads of state mainly exchanged views on the China-US relations and the situation on the Korean Peninsula issue. We have issued the relevant press release and you may carefully read that. As to the situation on the Korean Peninsula, President Xi stressed four points: first, China and the US share common interests in achieving the denuclearization and upholding peace and stability in the Korean Peninsula. Second, the relevant parties should exercise restraint and refrain from words and deeds that may escalate tensions. Third, the final solution of the Korean Peninsula nuclear issue comes down to the commitment to the general direction of dialogue, negotiation and political settlement. 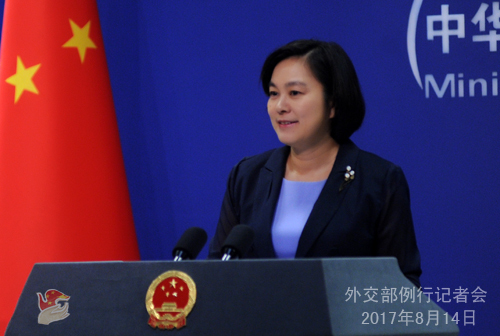 Fourth, China stands ready to keep communication with the US side on the basis of mutual trust and to jointly promote the proper settlement of the Korean Peninsula nuclear issue. President Trump said he fully appreciated China's role in the Korean Peninsula nuclear issue and the US side was willing to maintain close communication with China on major international and regional issues of mutual concern. Q: Many people think that the US wants to pressurize China on economic and trade issues and use it as a means to compel China to exercise pressure on the DPRK. What's your comment on that? A: I shall stress that the cooperation between China and the US should be based on mutual respect for each other's major interests and concerns. The Korean Peninsula issue and the economic and trade issue fall into different categories. China and the US should respect each other and strengthen cooperation on these two issues. It is obviously improper to use one issue as a tool to exercise pressure on the other. Q: There's attention on Vice Premier Wang Yang's upcoming visit to Nepal. Can you brief us on the agenda and topics of this visit? A: We have release the relevant information. At the invitation of the Pakistani and Nepali governments, Vice Premier Wang Yang will attend the activities marking the 70th anniversary of Pakistan's independence and visit Nepal from Aug 13 to 17. We have issued the news release on the meeting between Vice Premier Wang Yang and Pakistani Prime Minister Shahid Khaqan Abbasi. As to the agenda of Vice Premier Wang Yang's visit to Nepal, Vice Premier Wang Yang will arrive in Kathmandu to start his visit in Nepal　on the night of August 14. Vice Premier Wang Yang will meet with Nepali President Bidya Devi Bhandari and Prime Minister Sher Bahadur Deuba, and hold talks with Deputy Prime Minister and Federal Affairs and Local Development Minister Bijay Kumar Gachhadar. China and Nepal are traditionally friendly neighbors and the relations between the two countries have maintained sound momentum for development. Vice Premier Wang Yang's visit is an important high-level interaction between China and Nepal in this year. Hopefully, this visit will further advance the implementation of the consensus on cooperation between the two leaderships and governments, deepen China-Nepal practical cooperation under the framework of the Belt and Road initiative and promote the indepth development of the China-Nepal partnership. Q: First, will the telephone conversation between President Xi Jinping and President Donald Trump last week help ease the tensions on the Korean Peninsula? Second, if the US counter-attack the DPRK on its ballistic missile strike on Guam, will China remain neutral? A: When answering CNN's question just now, I briefed you on the contents of President Xi Jinping's telephone conversation with President Donald Trump at request. Indeed, the situation on the Korean Peninsula is a main topic for the telephone conversation between the two heads of state. During the conversation, President Xi Jinping has stated China's position. President Trump said he fully appreciated China's role in the Korean Peninsula nuclear issue and the US side was willing to maintain close communication with China on major international and regional issues of mutual concern. On your second question, it is not appropriate for me to answer such a hypothetical question, neither do I want to do so. I hope the situation will move towards deescalation. At present, as the situation on the Korean Peninsula is at a crucial juncture, we hope various parties can take seriously China's "suspension for suspension" proposal and find a breakthrough and an effective way out for the resumption of peace talks and peaceful settlement through political and diplomatic means. We hope under the current circumstances, various parties can mainly focus on easing the tensions and early resumption of talks. Q: The Kenyan opposition leader Raila Odinga has rejected the defeat in the election held in Kenya last weekend, claiming there was widespread fraud. However, the international observers in general say the election was conducted largely fairly. China has very close relations with Kenya, as it does with many African countries. Does the Chinese government believe there was any fraud in this election? Does China believes the opposition leader Raila Odinga should accept the defeat? A: As you mentioned, we have also noted that the African Union, the European Union and the British Commonwealth of Nations and other international electoral observers have affirmed the organization work of this Kenyan election. We have noted the result of the election declared by Kenya's Independent Electoral and Boundaries Commission. We respect the choice of the Kenyan people and congratulate President Uhuru Kenyatta on his reelection. China and Kenya are good friends, partners and brothers. The Chinese side is willing to work with the Kenyan side to promote the development of the friendly cooperative relations between the two countries for greater achievements. Q: It is reported that three days ago, the US President Donald Trump said he is thinking about a military option in Venezuela. At the same time, the White House says President Donald Trump rejected a phone call from the Venezuelan President Nicolas Maduro. What's your opinion about this? A: We have noted the relevant reports and remarks of some Latin American countries. 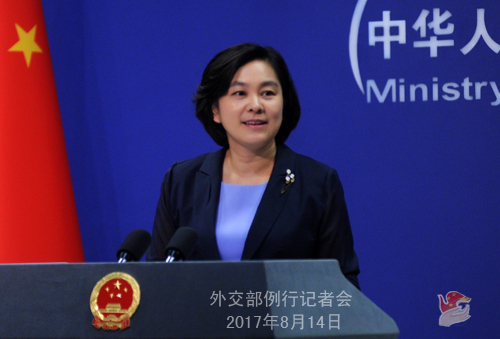 China has always followed the principle of non-interference in other countries' internal affairs, and maintained that countries should properly handle their relations based on the principles of treating each other as equals, mutual respect and non-interference in each other's internal affairs. Q: According to our information, the US Chairman of Joint Chiefs of Staff General Joseph Dunford is arriving in Beijing this evening. Please brief us on what his program is. What will be the topics of discussion from the Chinese side? Who he will be meeting with? A: I would like to refer you to the Ministry of National Defense. I believe the two sides will exchange views on the current issues of mutual concern. Q: If the US side does start the formal investigation into whether the Chinese government, agencies and companies have been unfairly acquiring intellectual properties from American firms, will China retaliate in any way against this decision? A: You said "if" again, and I won't make specific comments on a hypothetical question. But in case of this issue, as I answered the question raised by CNN just now, the nature of China-US economic and trade relations are mutually beneficial and win-win. The two sides have reached important consensus on how to handle the problems in our economic and trade relations through the China-US Comprehensive Economic Dialogue. I hope the two sides can, in spirit of mutual respect, equality and mutual benefit, address each other's concerns through dialogue and uphold the sustained, sound and steady development of China-US economic and trade relations. I have noted the criticism of China on the issue of intellectual property rights (IPR) protection by certain people in the US. I should stress that China has highly valued the protection of IPR. In recent years, we have promulgated and improved the relevant laws and regulations, stepped up our efforts to crack down on the crimes of IPR infringement, paid attention to raising the awareness of IPR protection of the whole society and our achievements are there for all to see. In addition, I can share with you some intriguing figures at hand published by articles in media recently: in recent years, China has promoted the upgrading and transformation of industries through innovation-driven development. Recent years have witnessed the blowouts of innovation in various fields, and China has drawn world-wide attention as a leader of innovation. As of 2016, the number of the application for patents have accounted for 38% of the world total, which ranks the first and is 1.9 times as many as that of the US; the number of papers on international journals have accounted for 21% of the world total, ranking the first; the sum of inputs in research and development has made up for 17.6% of the world total, nearing that of the US. We hope the US side can view the relevant issue in a matter-of-fact way and objectively remark on China's efforts and progress in IPR protection and its achievements in innovation-driven economic development. Q: It is said that toady China had released all the employees of the Australian Crown Resorts Group that were detained. Can you confirm this information? Have they already been deported from China? A: According to the information offered by the relevant authorities, on August 12, the Australian employee of the Australian Crown Resorts Group completed the serving of sentence and was deported from China on that day. We hope relevant countries can instruct their nationals in China to faithfully observe laws and regulations and not to engage in illegal and criminal activities. Q: Recently, the situation on the Korean Peninsula has been severe. Does China plan to send a special envoy to the DPRK? A: I can tell you that, as a close neighbour to the Korean Peninsula, China has closely followed the development of the situation on the Peninsula and always made its efforts and played its role to promote the early resumption of peace talks among various parties. At present, China is keeping close communications with all relevant parties of the six-party talks. I believe China's position is clear to all. Q: It is reported that the Chinese Government Special Representative on the Korean Peninsular Affairs Wu Dawei has retired, and Assistant Minister Kong Xuanyou has taken over his position. Can you confirm that? Will the new Special Representative be entrusted with certain special tasks as the situation on the Korean Peninsula is relatively tense? A: Assistant Minister of the Ministry of Foreign Affairs Kong Xuanyou has succeeded Wu Dawei as the Chinese Government Special Representative on the Korean Peninsular Affairs, but this has nothing to do with the current development of the situation on the Korean Peninsula. The Chinese government's position and polices on the Korean Peninsula issue have been consistent. We will continue to, proceeding from our long-held position of upholding international non-proliferation regime, peace and stability on the Peninsula and China's strategic and security interests, make our own efforts for the early resumption of talks and proper settlement of the Korean Peninsula issue. Q: Is the newly-appointed the Chinese Government Special Representative on the Korean Peninsular Affairs going to visit the DPRK shortly? 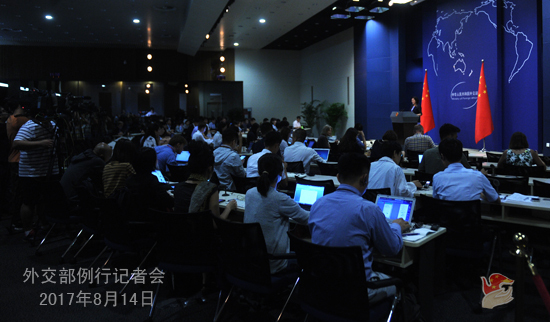 A: China has maintained close communications with all relevant parties of the six-party talks. By far I do not have any information to offer on whether Assistant Foreign Minister Kong Xuanyou has specific program of visit or not. Q: It is reported the Dalai Lama has canceled his visit to Botswana due to health reason. There is speculation that this has something to do with China's warning to Botswana. What's your comment on that? A: We have noted the relevant reports. I would like to point out that China has always been firmly opposed to Dalai's trip to any country for activities aimed at splitting China in any capacity or name. This stance remains firm. The Chinese side values the development of friendly and cooperative relations with Botswana and hopes the relations between the two countries can continue to develop in a positive and steady way. Q: First, the newly appointed ROK defense minister stated in a report to the congress this afternoon that in order to cope with the current tensions on the Korean Peninsula, the ROK will make its utmost efforts to speed up the deployment of THAAD system. Second, there are different opinions on the DPRK's claim of an attack on Guam. Some think this is highly possible while others think otherwise. How do you see this? A: we have stated multiple times China's principled position on the THAAD issue. The THAAD deployment will neither help address the security concern of the ROK nor resolve the Korean Peninsula nuclear issue, yet it severely undermines China and other regional countries strategic and security interests. We demand that the ROK face up to China's security concern and stop the THAAD deployment. On your second question, I won't make any speculation.